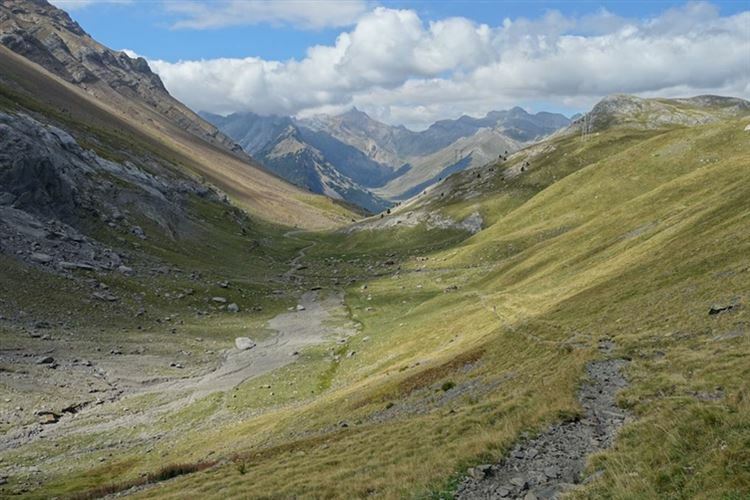 Probably the finest single walk in the Pyrenees for drama and variety: a spectacular circuit or loop through France and Spain, across the heart of the high Pyrenees through National Parks and a World Heritage Site. Cross the high ridge (and national border) through the famous Breche de Roland high above the even more famous Cirque de Gavarnie, then wind through the spectacular Ordesa Canyon. You can then return to Gavarnie on the third day or make a longer circuit, or loop back into France via a further-away pass to create even more variety. And you can of course make this circuit from Spain, the obvious start/end being the pleasant town of Torla. Magnificent scenery throughout, with some natural wonders thrown in - and fascinating vegetation and animal life. This is tough walking in high, and at times remote mountains. Come prepared. This is probably the greatest single walk you can do in the Pyrenees, a spectacular circuit or loop across the heart of the high Pyrenees through National Parks and a World Heritage Site, crossing the high ridge (and national border) through the famous Breche de Roland high above the even more famous Cirque de Gavarnie, then winding through the spectacular Ordesa Canyon in Spain. You can then return to Gavarnie on the third day or make a longer circuit, or loop back into France via a further-away pass to create even more variety. And you can of course make this circuit from Spain, the obvious start/end being the pleasant town of Torla. This is the finest day walk you can do in the Gavarnie area, indeed one of the finest in the whole Pyrenees, a spectacular ascent to the famous Breche de Roland, a breach in the wall of cliffs that forms the national border high above the even more famous Cirque de Gavarnie. The Breche is a huge gap in the high cliff-line of such peculiarity, mainly because of its size and sheer-sided symmetry, that it resembles a broken tooth in a perfect face, or a dying hero's sword-mite, which is how the Roland legend has it. In fact, the area has been carved by mighty glacial forces, which, above the extraordinary Gavarnie cirque, have carved the nation-dividing high ridge into a narrow spine and then broken through at the Breche. The tough or fundamentalist can begin deep in the valley at Gavarnie, and there are various ways up (some potentially deadly), the main one following the grassy Pouey Aspé valley up from the Gavarnie valley-bottom to the Port de Boucharo. It time is shorter or stamina or commitment less, you can start very immediately from a carpark at 2,000m on the Col de Tentes, west of Gavarnie. The broken remains of a road hugging the steep hillside contour round to the nearby Port de Boucharo and the Spanish border, with views straight onto the tremendous cliffs that climb to the high ridge that separates France from Spain. After a gaze into the typically Pyreneean valley to the west inSpain, you are contouring on a series of balconies in these cliffs back eastward towards the high cliffs and shelves above Gavarnie's famous cirque. This balcony walk is heart-swellingly beautiful and dramatic. After an hour or so, you turn south into the lower reaches of a high sub-cirque. After a bit of a slog, crossing a frigid stream beside a waterfall, then climbing, beside what is claimed to be a glacier but which looks like a steep icefield, under very perfect orange cliffs, you gain the Sarradets ridgetop, a perfect place for a snack. You can now see across the top of the Gavarnie cirque to the top end of the famous waterfall (claimed to be Europe's highest) cascading into the cirque, and on to the vast broken Marboré massif to the east. The Rufuge de Sarradets is 5 minutes on, and is superbly sited, with similar eastern views but also with a clear view up toward the Breche and the high cliffs. From the refuge you work up a steep spine of shale, which looks like a glacial leftover. To your right is a long slope of permasnow. Above is a low cliff of brown limestone over which a river of white stones has spilled over the millennia from the ridgetop cliffs far above. Over the cliff-edge, you a swing up a steep "glacier" (another static ice-slope), then scramble up a final rock-face for a sudden-feeling arrival at the great gap in the cliffs. The ice is slippery, so feel for the footholds with some care as the long slide to the rocks at the bottom has little appeal. Crampons are used by some. You are struck by how narrow the great range-top wall is, and how high. This really is an extraordinarily atmospheric place, and the photos seldom do justice to the huge scale of the walls and the perfectly-cleft gap. The views are of course to die for (which you could), and utterly different: the sheer rock faces and moist greeneries to the north contrast with the dry ridges receding bluely to the invisible plains of Spain to the south. Immediately to the south is a bare, pale beige, wedding cake of alternating steeps and layers, immediately behind it the lips of the vast Ordesa Canyon. A steep but easy and in places shale-slidey drop away from the breche gets you to a path that descends an incipient canyon, then crosses wildly broken lanes of vertical strata of limestone and scrambling across an almost-cliff round to a pass. You can head on east, or cross to the far hillside and crunch round its northern flank on shale chips, another rather remarkable stretch of walking, for a viewing across to the Ordesa's enormous upper cliffs. After winding back north through a maze of faintly weird lanes worn into the bare limestone pavement, you swing east and up to a low ridge, from which you gain a beautiful and again faintly weird view of small parallel valleys separated by low walls of limestone. A steady descent get us to a superb viewpoint over the wide basin with its alternating levels separated by low cliffs, which feeds the upper Ordesa canyon. Wonderful walking, bouncy grassy alternating with water-etched pavements of limestone, get you to the valley-end. Through a narrow gap in a wall, you clamber down a nearly-sheer wall of broken limestone high above the basin, then a final tramp down across a delightful grassy slopes gets us to the Refugio de Goriz, which is old-style, its dormitories packed with narrow mattresses. See our Breche de Roland page for more information, and William's account of this walk below. (Before tackling the great Ordesa canyon, you could spend one or more happy days walking from the Goriz refugio, perhaps climbing the tough but magnificent Mont Perdu/Monte Perdido, the second-highest peak in the entire range, or climb or circuit round Punta Tobacor high above the gorge's north rim. Or walk the trail above the south rim, with views back to the high peaks of the border ridge. See our Ordesa/Monte Perdido page. The Ordesa Canyon is walkers' heaven, a 15km (or so) long, extraordinarily evenly proportioned glacial gouge running pretty well straight for much of its length through the prevailing limestone, in place 1,000m deep and lined on both sides with huge and dramatic cliffs. It truly is a majestic and inspiring sight, from all angles. Whereas the highlands behind its rims are sparse semi-desert, the interior of the canyon is a very different world, a lusher mix of grassland at its top end and pine forests carpeted with ravishing vegetation and interspersed with lovely mixed deciduous woodland, which becomes predominant further down. Wildlife includes sorrios (chamois) and 31 other mammal species as well as a huge selection of birds. There are different ways of checking out the canyon. - a fine trail (a section of the great GR11 route) follows the length of the canyon bottom, from the great Horse's Tail waterfall at its head down to the la Pradera carpark inside the canyon or on to the bottom near Torla. - the most extraordinary of walks, though, is the Faja de Pelay, which follows an balcony in the upper cliffs for some 8 km from the head of the canyon to the incredible viewpoint around two-thirds of the way down, when a steep, 600m ascent/descent must be made to/from the valley floor. - there are more challenging cliff walk, such as the Faja de los Canarellos, which winds (in places giddily) around the central northern cliffs, or the Faja de Racon and Faja de las Flores walks. - there are superb walks along both rims, the southern rim in the end getting you to Torla. 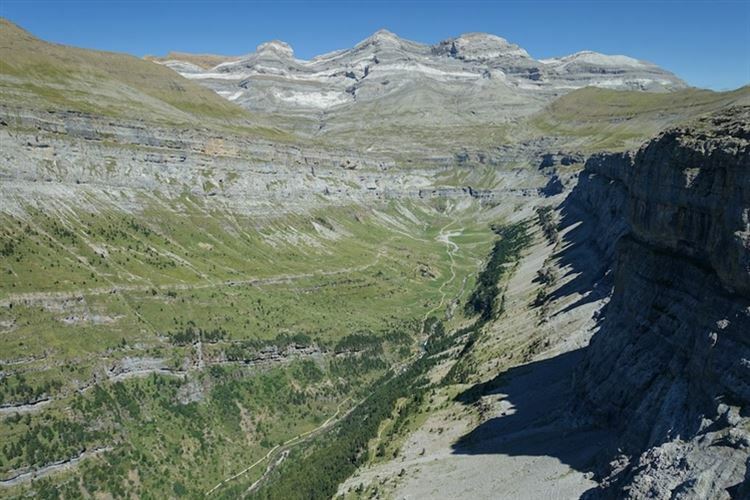 See our Ordesa Canyon page for further information and photos. You can finish up in civilization at the pleasant Torla to the south of the Gorge?s bottom, or head north up the Ara valley to the Pescadores or Bujaruelo refuges. Or return to Goriz. There is endless choice about what to do next. A lot of walking can be fitted in in the Ordesa/Monte Perdido region before you head back to France. 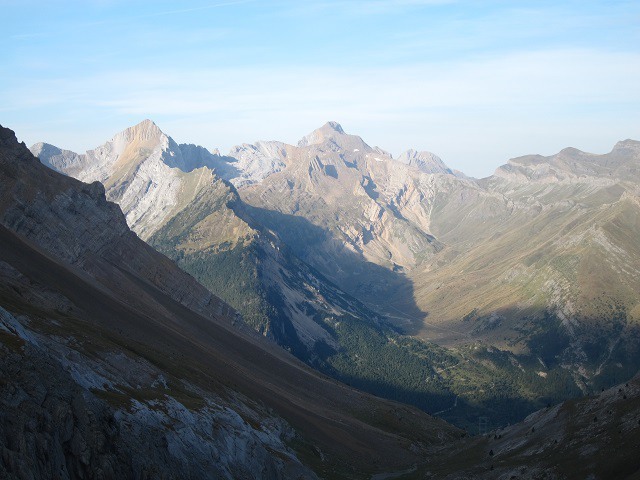 Assuming you have gone up the Ara valley, north of Torla, you can climb steadily but steeply back east from San Nicolas de Bucharuelo to the Port de Boucharo and on to the Col de Tentes or down to Gavarnie, to get back in 3 days. A 3,000m or so ascent. Or you can head on the GR11 up the increasingly spectacular Ara valley, right under the Vignemale massif, turning right up to the valley head, joining the HRP shortly before the Puerto d'Arratil pass (at 2,528m) back into France, to get to the Refuge Wallon in the beyond-beautiful Marcadau valley in a long day's walking. See our Marcadau page for further options from Refuge Wallon. 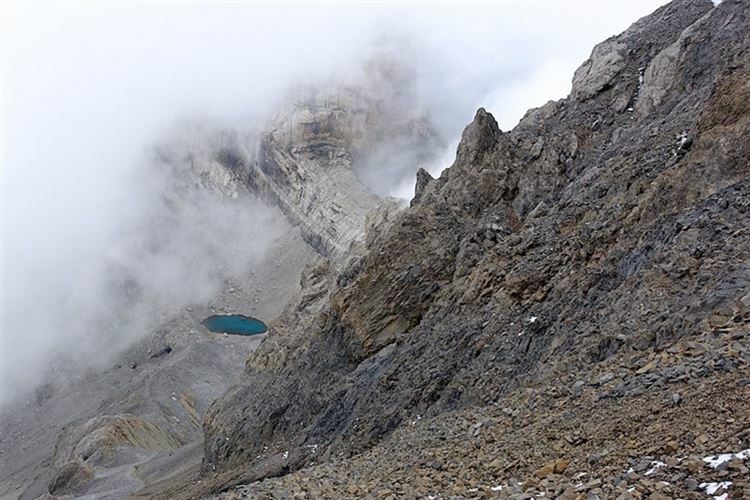 Or you can cross from the top of the Ara valley on the HRP via the 2,760m Puerto de Cauterets, on the high ridge right next to Vignemale, to the head of the wild, tough but ravishing Vallé de Gaube and the Oulettes de Gaube refuge. From here you can climb huge Vignemale or head down-valley to join the lower Marcadau valley, or even follow the HRP and GR10 back toward Gavarnie. The choices are endless. Another outstanding option would be to return to Goriz after exploring Ordesa, then head east across the heads of the Anisclo gorge and Pineta valley, crossing the high ridge back into the top of the Cirque d'Estaubé and thence on via the Hourquette d'Alans back to Gavarnie. Expect rain at any time, although you will be unlucky not to get some gorgeous clear days in summer and early Autumn. Severe Summer thunderstorms are a regular feature which require immediate descent away from maximum exposed areas, and Summer can be very hot. Snow lies late, with the high range only really clear by mid July. Parts of the range really heave with tourists in high summer (Gavarnie and Ordesa especially), and many day walks are busy at that time. So, come prepared to tolerate. Accommodation really comes down to the refuges - although they get busy (Goriz is said to be the busiest in the Pyrenees), so book well ahead if coming in the popular months. Camping is very restricted in the high country, so check out the current requirements at the planning stage. Mention must be made of one particular guidebook, Cicerone's Walks and Climbs in the Pyrenees which you should not approach this area without. SEE OUR FRENCH PYRENEES AND SPANISH PYRENEES PAGES FOR FURTHER PRACTICAL AND GENERAL INFORMATION AND MORE PHOTOS. 7-day walk: Day 1: Gavarnie to Refuge de Goriz. Day 2: Monte Perdido Day 3: Goriz via Anisclo Gorge to Nerin (Palazio Hotel) Day 4: Nerin to Torla Day 5: Ordessa Gorge circular walk Day 6: Torla to San Nicolas de Bujaruelo day 7: San Nicolas to Gavarnie Flights were via Toulouse, then 2 hour drive to Gavarnie Hairy bits: turning left after Breche de Roland instead of heading down into the valley: resulted tough scrambling on loose rock before we found our path. Monte Perdido: we nearly fell off - ask for advice in Goriz Refuge and you'll be fine. Path down into Ordessa Gorge from Torla side is rightly signposted 'difficult path' but is actually fine. Walko says, thanks, and for the lovely photos!